Will storm force a hog waste reckoning in N.C.? 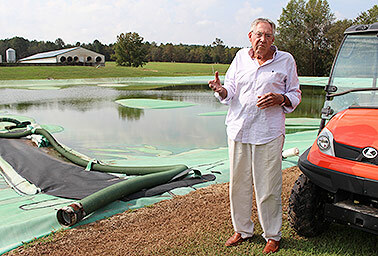 LILLINGTON, N.C. — Tom Butler didn't have to worry about manure lagoons overflowing when Hurricane Florence dumped a foot and a half of rain on his hog farm. He's kept them covered under heavy plastic for the last decade. Butler stands out among hog farmers for siding with environmentalists who push for more aggressive measures to prevent leakage of animal waste into waterways. This time, his precautions paid off, but he said the rest of the industry still sees him as more of an annoyance than a hero. "Lagoon covers are not the answer," Butler said as he walked out about 15 feet onto the surface to check on the level of the water he's pumping off. The one-eighth-inch-thick, rubbery cover gave a little under each step. "They're a way. They're a step, just a Band-Aid," Butler said. "We have to stop storing our waste." Hurricane Florence could force a reckoning about how farmers in the Carolinas and other areas at risk of floods manage livestock waste. Here, hog waste is typically stored by the millions of gallons in lagoons, which are prone to overflowing or even breaking during big storms. More than three dozen hog waste lagoons around the state overflowed, suffered breaches or were inundated when Florence dumped rain by the foot, the state's Department of Environmental Quality reported. Animal waste that escapes during storms flows into rivers and poses a risk to drinking water, among other hazards. The problem is nothing new to North Carolina farmers. 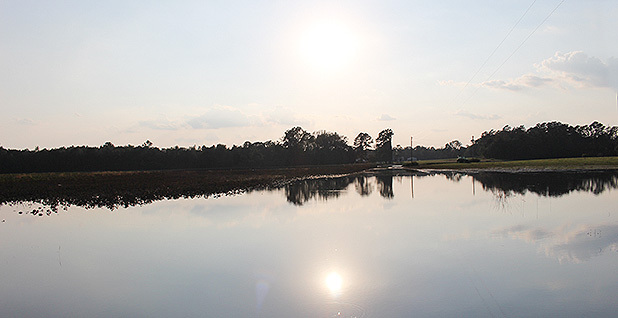 Hurricane Floyd in 1999 flooded 50 swine waste lagoons statewide, and half a dozen suffered structural breaches, according to the North Carolina Pork Council, an industry group. Hurricane Matthew, in 2016, was milder, with 11 flooded lagoons and no breaches, the Pork Council said, although the environmental group Riverkeeper has said the industry group underestimates the impacts. Hurricane Florence, with its bigger rain totals, represented a step back. The state DEQ reported five lagoons with structural damage that may have resulted in breaches, 32 lagoons that overtopped, nine lagoons inundated, 18 lagoons that likely overtopped and 39 lagoons that came within 3 inches of overfilling as of noon yesterday. Breaches occur when heavy rain erodes the earthen berm surrounding a lagoon. That can happen in places where tree roots, for instance, grow, or where rodents burrow, said Kemp Burdette, a spokesman for Cape Fear River Watch in Wilmington. In those cases, manure can pour out, as opposed to the more diluted spill that happens when a lagoon overflows in heavy rain. Lagoons are inspected annually by state environmental authorities, but the oversight is minimal, and the state no longer conducts flyover surveys that would help develop a full picture, Burdette said. 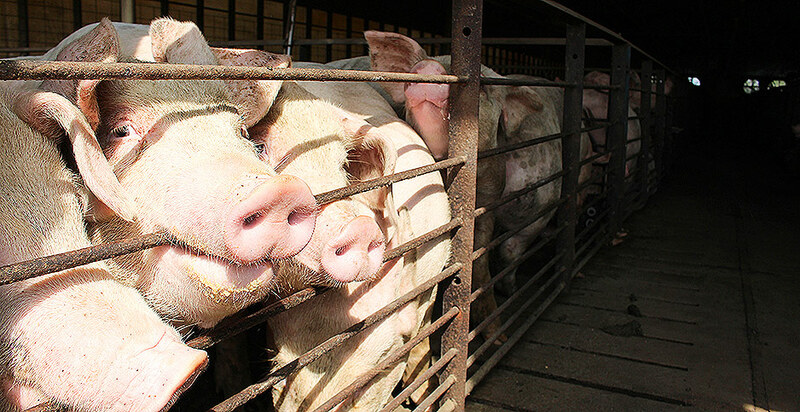 The Pork Council downplayed the impact on hog farms, saying the number of affected lagoons is a small fraction of the total number statewide and that the rainfall over four days was historic. Some areas saw upward of 30 inches — almost double the rain on Butler's farm. "While we are dismayed by the release of some liquids from some lagoons, we also understand that what has been released from the farms is the result of a once-in-a-lifetime storm and that the contents are highly diluted with rainwater," the council said in a Sept. 19 post on its website. In addition, the council said, pork producers worked ahead of the storm to pump enough liquefied manure out of the lagoons and spray it on fields so that heavy rains wouldn't top them. That followed state protocols and worked well overall, the group said. The industry's stance, held by the Pork Council and integrators such as Smithfield Foods, is a disappointment to Butler, who has been pushing for more measures to reduce the risk of pollution. He's testified in court cases against Smithfield, and he's had political leaders to his farm, including former Agriculture Secretary Tom Vilsack during the Obama administration and the area's Republican state representative, David Lewis. Some politicians stay away, he said. He's been critical of the company he works with, as well; Clinton, N.C.-based Prestage Foods Inc. owns the hogs on the farm. "I'm the most hated person in North Carolina in the pork industry," said Butler, who added that he's tried to limit his criticism to big corporations that control the business, not to the hog industry as a whole. "That's my sin, I've told the truth." Lagoon covers aren't perfect, either, he said. Guaranteed for 15 years, they occasionally have a breach of their own, attracting swarms of flies. The industry doesn't lack for ideas about how to handle waste more cleanly. Barger Tech Ltd., based in Ohio, has been trying to sell a system called the Lagoon Eliminator, which pumps waste into tanker trucks at the farm, which transport it to a nearby plant that turns it into biogas and fertilizer. That system hasn't caught on much. But a company called Optima BioEnergy, in Wilmington, has had more luck, launching a project to harness renewable gas from manure on three farms in Duplin County. The operation sells the resulting energy to Duke Energy. Burdette, the Cape Fear riverkeeper, said he doesn't put much faith in any manure lagoon. "They're always at risk of failure," he said. Instead, Burdette said, the state should go back to an idea that started after Hurricane Floyd — to buy out farms in the floodplain and shut down the lagoons. As many as 200 remain in the floodplain, he said, and the law providing for buyouts is still valid, if unfunded. "All they had to do was move funds into the buyout program, but they didn't," Burdette said. A bigger challenge awaits at the bottom of the lagoons: 20 years' worth of settled sludge. It doesn't escape when lagoons overflow, but sooner or later, farmers and the companies they work with need to decide what to do with it, Butler said. Butler said he figures he has as much as 6 million gallons of sludge. Harnett County, where Butler lives, had 73,979 hogs and pigs in 2012, according to the Department of Agriculture. Nearby Sampson County had 1.8 million. "This is exactly the same case for all of them because they were built at the same time, especially down in hog country," Butler said. "Nobody wants it. Everybody has it."